Boats sit docked in Wolfeboro Bay in Wolfeboro, N.H. The town is where former Republican Presidential candidate Mitt Romney will spend the week in lieu of going to the Republican National Convention in Cleveland. WOLFEBORO, N.H. — Mitt Romney padded out of his lakefront house Monday in bare feet, shorts, and a rumpled blue golf shirt. He was deeply tanned and his hair was wet, as though he had just taken a dip in Lake Winnipesaukee. Grandchildren zoomed around him on scooters. Then he politely told the visitors to get lost. 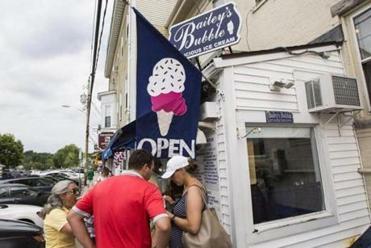 Some in town — where Romney is occasionally spotted jogging or buying ice cream at Bailey’s Bubble — said they could not blame the former governor of Massachusetts for choosing to spend the week in Wolfeboro instead of Cleveland. People line up for ice-cream at Bailey’s Bubble, an ice cream shop frequented by former Republican Presidential candidate Mitt Romney in Wolfeboro, N.H.
Gail Yoder, who was visiting from Allentown, Pa., said she admires Romney for taking a principled stand by staying put in Wolfeboro instead of going to Cleveland to back a nominee who is so divisive. “Good for him,” she said, as she enjoyed a dripping cone of raspberry chip ice cream. Besides, one could argue that Wolfeboro in July has some distinct advantages over Cleveland. 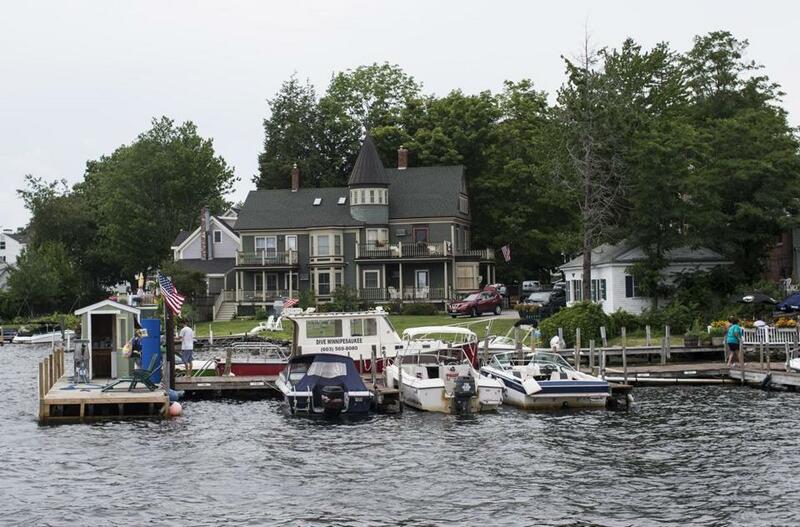 After all, one is a quaint New England village of fewer than 3,000 residents that offers casual lakeside dining on lobsters and oysters, or breezy jaunts on the Winnipesaukee Belle, a replica 19th century paddleboat. The other is a sweltering Midwestern industrial center packed with protesters, police, and partisans, where the local delicacy is a “Polish boy” sandwich stuffed with kielbasa, cole slaw, and barbecue sauce. Bill McGinn, a tree service worker who lives a block from Romney, said the former governor was undoubtedly making the right call by opting for Wolfeboro this week. Bill McGinn talked about former Republican presidential candidate Mitt Romney’s decision to skip the Republican National Convention in Wolfeboro, N.H., on Monday. Romney is not the only former GOP star who’s shunning Cleveland. Both former presidents Bush, as well as the 2008 nominee, John McCain, are skipping the convention. Still, this week represents a particularly dramatic shift for Romney, who just four years ago was preparing to accept the Republican nomination at the convention in Tampa. This year, he has repeatedly criticized the presumptive nominee and helped to lead the so-called “Never Trump” movement, which sought to draft a challenger who could derail the bombastic New York City real estate mogul. Given that history, Richard Pareti, a summer resident who supports Trump, said he could not fault Romney for shunning Trump in Cleveland. Jim Benjamin, a Lowell gas company worker who was vacationing in Wolfeboro, said he was of two minds on Romney’s decision. From a political standpoint, he said he felt that Romney should be in Cleveland, helping to unite the party and elect Trump. But asked if he would rather spend the week jammed into the Quicken Loans Arena with thousands of delegates in Cleveland or by the water in Wolfeboro, he did not hesitate. “By the lake, for sure,” he said.